PORTLAND — The committee tasked with exploring where a new service center may be established for the city’s homeless population is not expected to make a recommendation until Sept. 25. 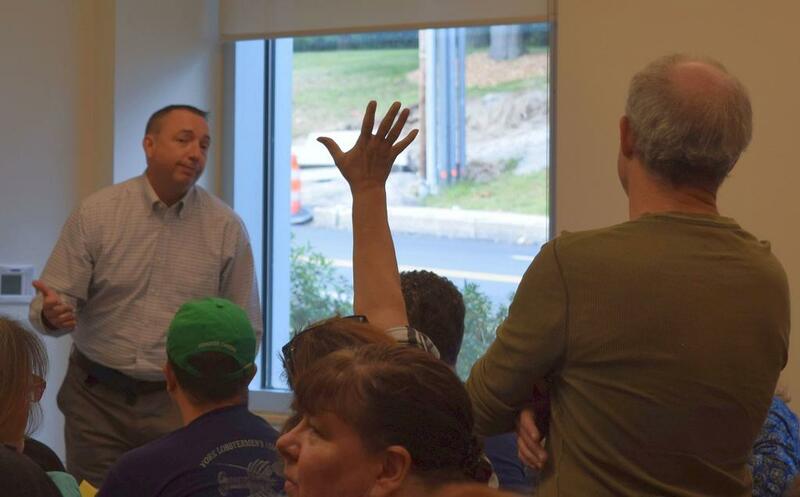 But after a 2 1/2-hour community forum Sept. 8 at the University of Southern Maine, the city’s plan to build a 200-bed shelter on Brighton Avenue to provide food, health care, mental health and substance use disorder services still appeared to be a hard sell. “From my perspective, this is not a done deal,” City Manager Jon Jennings said in an individual breakout session at the forum that followed a 50-minute general presentation on the elements of the plan he first announced in June. The council has not approved the plans, he added. More than 160 people attended the general session, which did not include public comment, before being invited to attend eight individual sessions that frequently ran over the allotted 20 minutes. On Tuesday, Sept. 11, the council Health & Human Services and Public Safety Committee, led by Councilor Belinda Ray, was scheduled to ask its own questions of city officials about the plans to build the shelter and service center on the grounds of the Barron Center in the Nason’s Corner neighborhood. Jennings and Ray also said Sept. 8 the committee would no longer be taking public comment on the plan, either at Tuesday’s session or the Sept. 25 committee meeting, when Ray and Councilors Pious Ali and Brian Batson are expected to make their recommendation to the full council. Opponents of the shelter plan have been speaking during each public comment session on non-agenda items at City Council meetings and will also be able to speak during future Planning Board and City Council hearings. In order to proceed with the plan, the city must amend the zoning map to allow the shelter as a conditional use. The Planning Board will make its recommendation on the amendment; it must be approved by councilors. The forum was also the first occasion the deeper details of the service center plan were presented, including how it measured against other sites considered by the city, the comparative cost of one shelter as opposed to five, 40-bed shelters throughout the city, and how city police intend to patrol the area. In the general presentation, Jennings said city officials reviewed six sites, all but one off the peninsula, to relocate the Oxford Street Shelter from Bayside. As part of the scoring, officials also considered a site off outer Congress Street suggested by opponents of the Nason’s Corner plan. The Barron Center land and “District Road” site off Congress Street were the only city-owned parcels considered. Jennings said the District Road site, actually owned by the Portland International Jetport, cannot be considered because the land was bought with assistance from the Federal Aviation Administration, which placed limitations on its use. Land on County Way near the Cumberland County Jail is too contaminated for consideration. A building on Read Street near Forest Avenue was under serious consideration, he added, but was ultimately donated to the University of New England, Jennings said. Because the city owns the land and meal service facilities are close by, the Barron Center site also makes sense, according to city officials. Cost estimates released by the city indicate a new shelter will cost $4.7 annually to operate, while five shelters will cost at least $10.2 million. It now costs $3.8 million to operate the Oxford Street Shelter. Opponents of the single service center plan, including Mayor Ethan Strimling and former Councilor Ed Suslovic, have suggested three shelters should be opened. Oxford Street Director Rob Parritt said Sept. 8 the five-shelter model was listed in order to meet individual needs. Yet splitting those shelters was also considered “logistically impossible for service partners,” and likely 20 percent more expensive to provide food service. Asked at a session about shelter guests coming to Nason’s Corner, Parritt said being on local bus lines was important, but the city would also be providing shuttle service and vouchers for taxis. “Our folks are getting all around town; you might not know it,” he said. Assistant City Manager Michael Sauschuck said the new shelter and service center, which would be open 24 hours a day, would be designed for better safety with its lighting, controlled access, and intake processing that would not leave people loitering outside the center. There would also be a community policing station inside the new shelter. Once the HHS Committee has made its recommendation, the plan would be discussed in an October council workshop, and possibly face a vote in November. Portland Assistant City Manager Michael Sauschuck, left, faces a skeptical group Sept. 8 at the University of Southern Maine as he discusses security for a proposed 200-bed homeless service center on Brighton Avenue.